Picture it: two 8-year-old girls sitting out on a porch in the summer heat. The ice cream truck has been in the neighborhood and they're settling in with their treats. My best friend gleefully unwraps her rocket bomb pop while I clutch my cone stacked with two scoops of butter pecan (my favorite flavor back then!). One lick, two lick, three, and then disaster strikes. 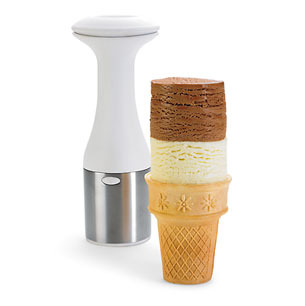 The ice cream tumbles off the cone and onto the steps. It's splat flat, way beyond the rescue of the 3-second rule. Is it this type of mishap that this gadget can prevent? Because other than that, I don't see why you would prefer flat disks over round scoops. Am I missing the point? Weigh in below.